FirstElement Fuel secures long-term renewable hydrogen supply for its California True Zero Network as Air Liquide invests over $150 Million to build the first ever liquid hydrogen production facility for the zero-emission hydrogen electric vehicle market. IRVINE, Calif., Nov. 26, 2018 /PRNewswire/ -- In a pivotal development for the hydrogen fuel cell electric vehicle market, FirstElement Fuel Inc has entered into a renewable hydrogen supply agreement with Air Liquide, which in turn will invest more than $150 Million to build a new liquid hydrogen production facility. The arrangement will enable FirstElement Fuel to provide 100% renewable hydrogen for customers of its True Zero Network, which will help the company achieve its goal of retailing hydrogen with zero greenhouse gas impact. "This signals a transitional moment for the hydrogen fuel cell electric vehicle market," said Joel Ewanick, Founder & CEO of FirstElement Fuel Inc. "Air Liquide is bringing significant private investment to build a key piece for growing California's Hydrogen Network. It's yet another indication of the momentum for hydrogen as a replacement for gasoline." The State of California – as a result of its vision for zero emission vehicles and the investments it has made to further that vision – has positioned itself as the global leader in fuel cell electric vehicle deployment and is now unlocking private investment dollars on a much larger scale than ever before. The initial investments made by California to jump-start the retail hydrogen network are being matched by Air Liquide's unprecedented investment in hydrogen infrastructure built to serve the fuel cell automobile market. The $150 Million investment from Air Liquide marks the beginning of a transition – while a combination of public and private monies will be essential over the next decade, private investment will eventually eclipse government subsidies and the retail hydrogen market will become profitable and self-sustaining with scale. California Energy Commissioner Janea A. Scott said: "The California Energy Commission has strategically invested in launching a backbone network of hydrogen refueling stations to enable the State's transition to vehicles with no tailpipe pollution. A critical next step in establishing a stable hydrogen market is increasing supply while bringing down costs—today's announcement by FirstElement and Air Liquide takes that step." FirstElement Fuel has been growing its True Zero Network in California, today the largest retail hydrogen network in the world, with financial assistance from the California Energy Commission, Toyota, Honda, the South Coast AQMD, and the Bay Area AQMD. 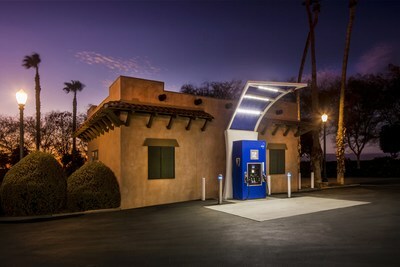 In addition to the long-term hydrogen supply agreement, Air Liquide has also signaled its intent to make an equity investment into FirstElement Fuel to assist the California-based company in further expansion of its retail hydrogen station network. Michael Graff, Executive Vice President & Executive Committee Member of Air Liquide S.A. and Chairman & CEO of American Air Liquide Holdings, Inc., said: "This new investment in hydrogen production and our collaborative relationship with FirstElement Fuel, further demonstrate our long-term commitment to the development of hydrogen energy for mobility, and accelerate the deployment of new hydrogen fuel cell electric vehicles — cars, trucks, buses — planned by automotive manufacturers like Toyota, Honda and other leading OEMs. We are convinced that hydrogen is an essential sustainable energy vector of the future and a cornerstone of the energy transition." Although hydrogen is already widely produced, a dedicated production facility will drive down cost and add reliability to the fuel supply chain for the rapidly expanding fuel cell electric vehicle market, helping FirstElement achieve its key objective of enhancing the customer experience. The facility's increased scale will help FirstElement reduce its price at the dispenser faster than previously anticipated, with a clear path to cost competitiveness with gasoline. "Global companies like Air Liquide do not make investments of $150 Million dollars unless they see a clear path to a return," Ewanick went on to say. "This is another indication that the fuel cell electric vehicle market in California is here to stay." Currently FirstElement operates 19 of its True Zero retail hydrogen stations with 12 more under development. The True Zero Network of stations spans from San Diego, throughout Orange County, Los Angeles, and the San Francisco Bay Area, and out to Santa Barbara and Lake Tahoe. Since the opening of its first station in January 2016, the True Zero Network has completed over 230,000 successful fills, eliminated more than 52 million gasoline miles and replaced them with zero emission fuel cell miles, and avoided over 32 million pounds of greenhouse gas emissions (in CO2equivalence). FirstElement Fuel Inc is a California-based company established in 2013 with the sole purpose of providing safe, reliable, retail hydrogen to customers of fuel cell electric vehicles. The company is the developer, owner and operator of the True Zero brand of retail stations, which currently represents the largest retail hydrogen station network in the world.